The perfect gift for the boater in your family! 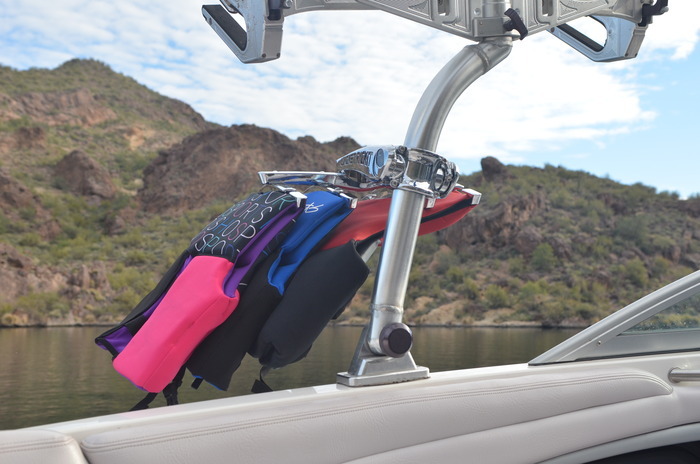 It's Like A wakeboard rack - but for your life jackets! It is a simple rack that lets you hang your life jackets outside of your boat... Giving you back precious space and making your boat feel bigger and roomier. 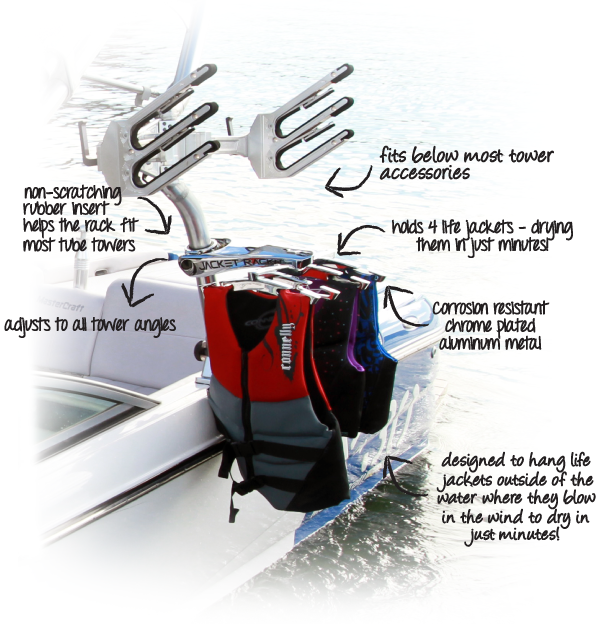 The Jacket Rack-it attaches to your boat tower just like a wakeboard or surfboard rack. When on the rack, your jackets are exposed to moving air and sunlight so they dry quickly! In our tests we found that a life jacket dried 7.5 times faster when on the rack compared to being on the floor of the boat and 3 times faster than when strapped to the tower. Before the Jacket Rack-it, many boaters who were sick of tripping on life jackets so they came up with unique ideas. The Tower Of Terror Manager was on the right track when they started snapping wet life jackets to the boat tower... The problem was that the jackets were tossed around like a rag doll. The jackets whip around and drip into the boat where they get partially dry. But the Jacket Rack-it solves both problems by getting the jackets all the way out of the boat where they drip into the water. At high speeds the jackets remain steady and stable on the rack. Here is a video of what it looks like traveling at 40 mph. Adjusts to all tower angles because of its 3 access adjustment points. Measures approximately 21" x 17.4" and weighs 17 lbs. Installs on most boats with tube towers and diameters between 1 3/4" and 2 1/2" (Use our "will it fit" guide here to see if it will work with your boat). We recently received a shipment of 452 racks with some minor cosmetic imperfections. The racks look great and are in perfect working order. They just have some slight imperfections or small brush like strokes on the chrome. To the untrained eye, many of these look to be in perfect condition. Rather than incur the cost of sending them back to the manufacturer we have decided to sell them at 50% off of retail price! No...because it doesn't need to. With a wakeboard rack you want a swivel because boards are heavy and the storage angles away from the boat..
With the Jacket Rackit it is a short reach... So you don't need a useless swivel to reach it. Will it fit my tower?